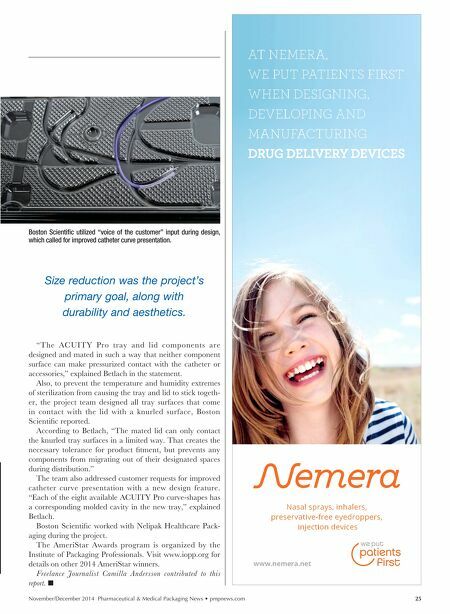 25 November/December 2014 Pharmaceutical & Medical Packaging News • pmpnews.com Size reduction was the project's primary goal, along with durability and aesthetics. "The ACUITY Pro tray and lid components are designed and mated in such a way that neither component surface can make pressurized contact with the catheter or accessories," explained Betlach in the statement. 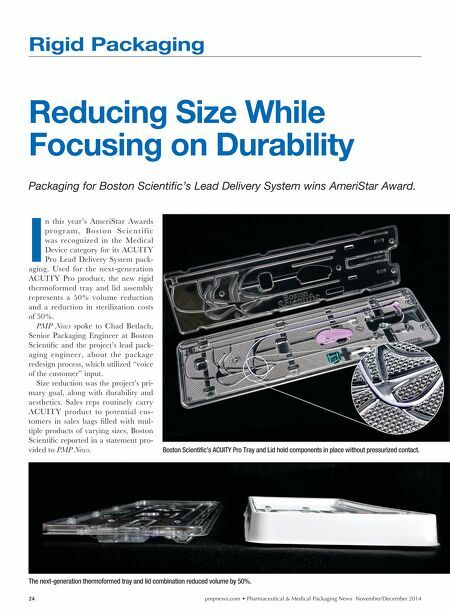 Also, to prevent the temperature and humidity extremes of sterilization from causing the tray and lid to stick togeth- er, the project team designed all tray surfaces that come in contact with the lid with a knurled surface, Boston Scientific reported. According to Betlach, "The mated lid can only contact the knurled tray surfaces in a limited way. That creates the necessary tolerance for product fitment, but prevents any components from migrating out of their designated spaces during distribution." The team also addressed customer requests for improved catheter curve presentation with a new design feature. "Each of the eight available ACUITY Pro curve-shapes has a corresponding molded cavity in the new tray," explained Betlach. Boston Scientific worked with Nelipak Healthcare Pack- aging during the project. The AmeriStar Awards program is organized by the Institute of Packaging Professionals. Visit www.iopp.org for details on other 2014 AmeriStar winners. Freelance Journalist Camilla Andersson contributed to this report. 0 Boston Scientifc utilized "voice of the customer" input during design, which called for improved catheter curve presentation.